Mercury is starting to climb up in the western sky for a pretty good appearance and tonight the crescent Moon joined Mars in the vicinity. I managed to get a few shots. 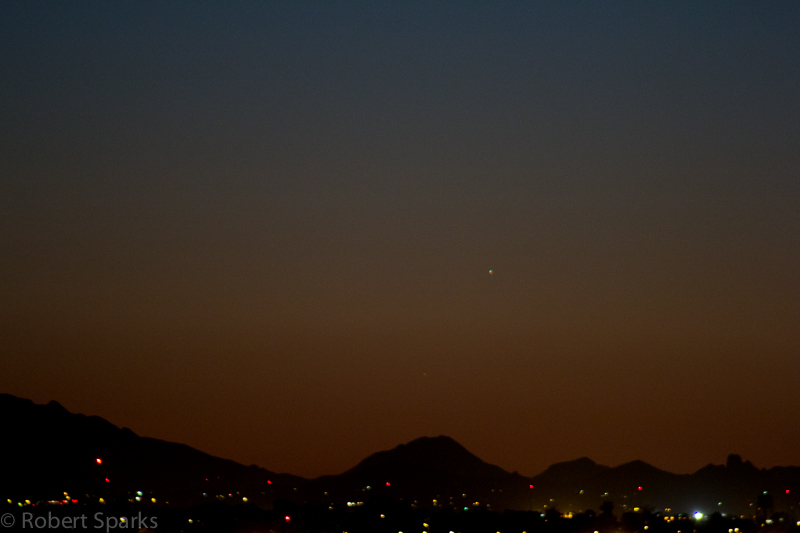 I expected Mercury to be difficult to see low in the sky, but it was much easier to find than the higher Mars. 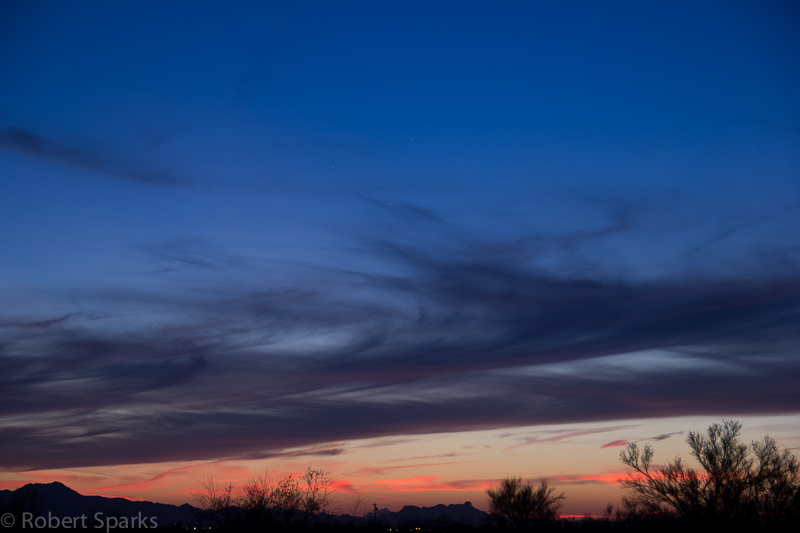 In these shots, Mars is to the the right and just below the Moon. Mercury is below Mars and just a little to the right. There are a couple of planes drifting through this part of the sky so don’t be fooled by them! I was doing a telescope training session for students last night, but of course I took along my camera. 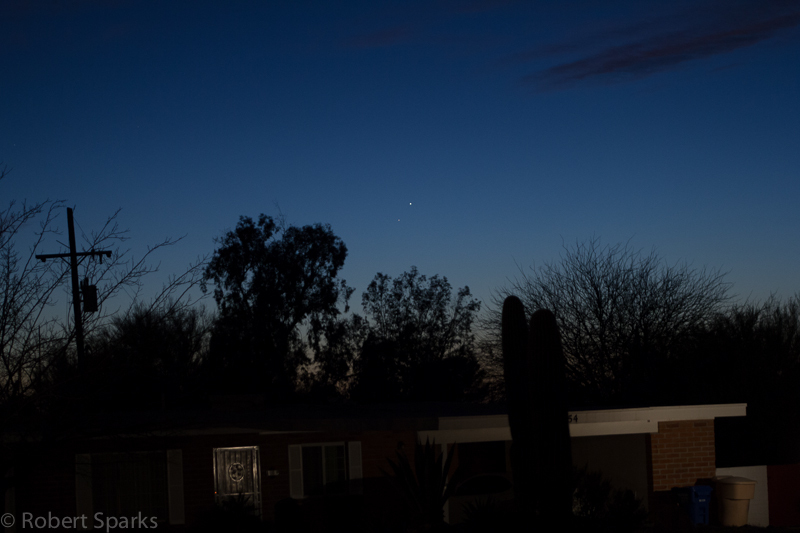 I got several photos of the planets and stayed after they left photographing a few other objects. 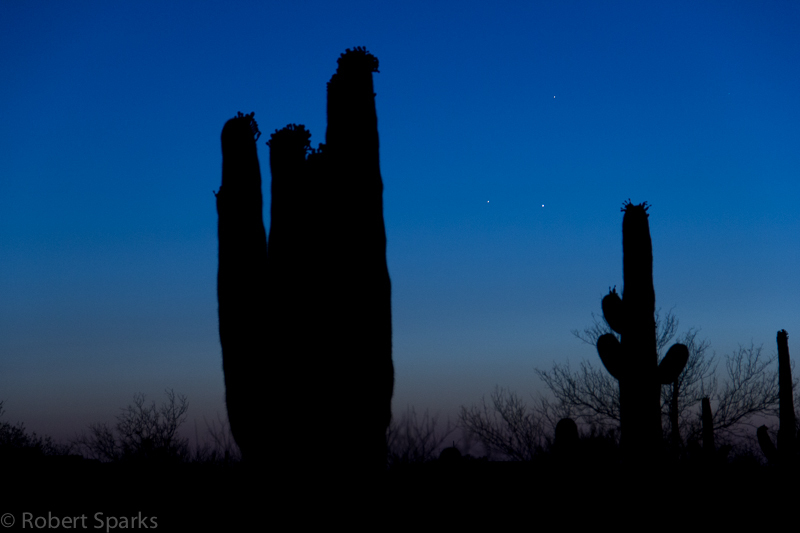 First, I have been posting a lot about the ongoing planet conjunction. 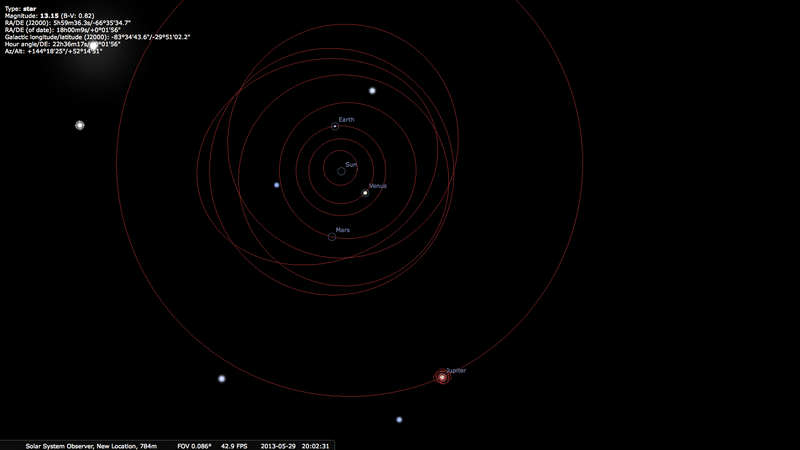 All the planets are now starting to spread out more each night and I thought it might be a nice time to look at where all the planets are in our solar system so I created a little view of the planets (out to Jupiter) in their orbits using Stellarium. Click if you want a bigger version. First find Earth (it’s labeled). Mercury is the innermost planet and I couldn’t get it to print the label, but you can see its orbit and find Mercury to the slightly to the right of the Sun. 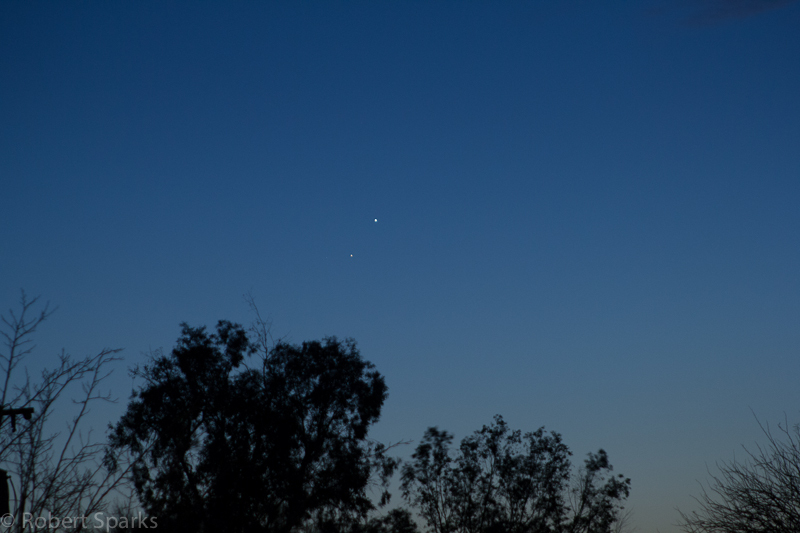 Now find Venus and Jupiter. You might notice you can almost draw a straight line through all four of these objects (not quite, but very close!) 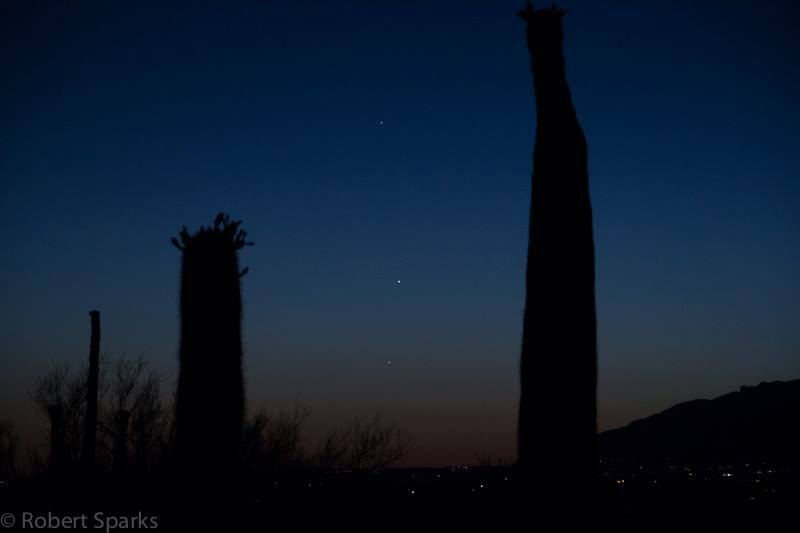 This line shows that if you are standing on Earth and look in that direction,you will see Mercury, Venus and Jupiter very close together in the sky which is exactly what has been going on the last couple of weeks. You also will notice this line passes pretty close to the Sun…therefore, we see them close to the Sun in the sky, in this case, after sunset (if they appeared on the other side of the Sun, we would see them in the morning…Mars is about to move into the morning sky). Remember Earth moves around the Sun faster than Jupiter so in the not too distant future, Jupiter will appear directly behind the Sun from Earth’s perspective. Therefore, Jupiter is getting lower in the sky each evening and will soon disappear behind the Sun. After that, Jupiter will reappear in the morning sky. So now that you know a little bit about why the planets have been doing this dance, let’s get to the latest pics from last night. They planets appeared almost in a straight line. 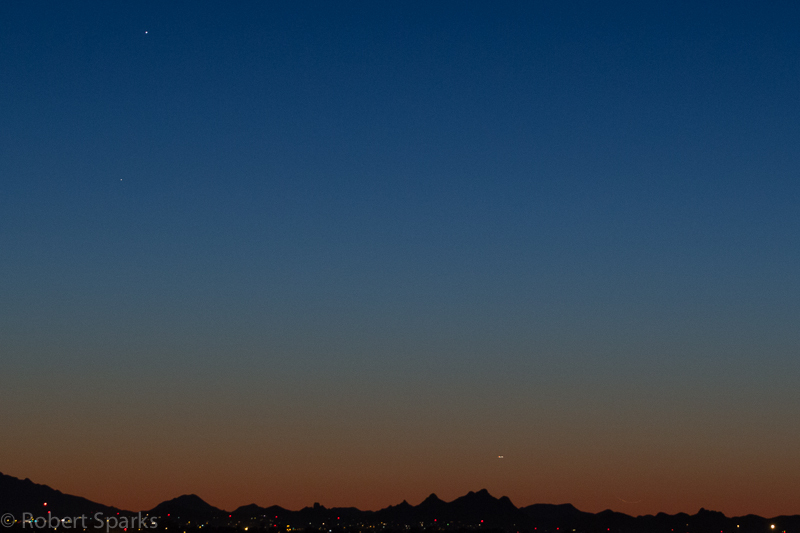 Mercury is at the top,Venus is in the middle and Jupiter at the bottom. 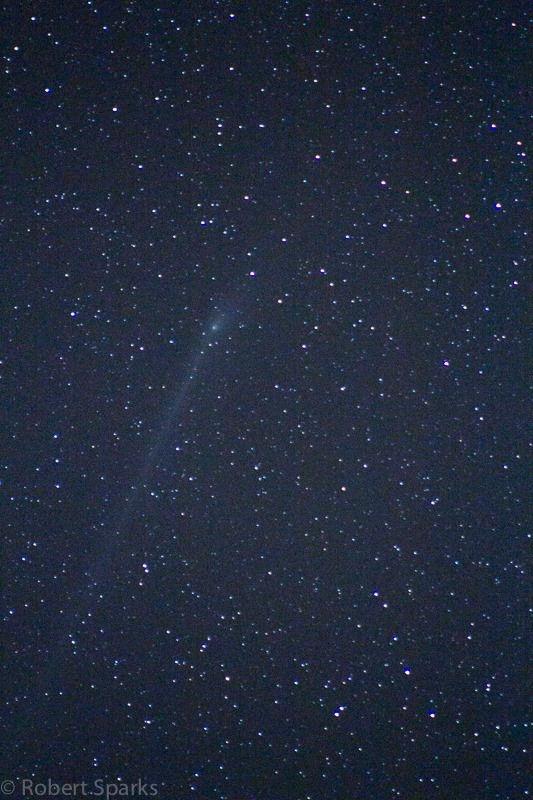 By the time the students left, it was totally dark so I went for Comet PANSTARRS again. I have the tracking mount and decided to push the exposure further this time. I got a little trailing (not a perfect alignment) but was still pretty pleased with the pics I got showing its nice long anti-tail. I honestly have no idea whey more people aren’t trying to photograph this…I know there are more skilled people out there with better equipment than I have…if I can do something this nice, they should be cranking out some jaw dropping stuff. Finally, I turned my sights toward something a little different. 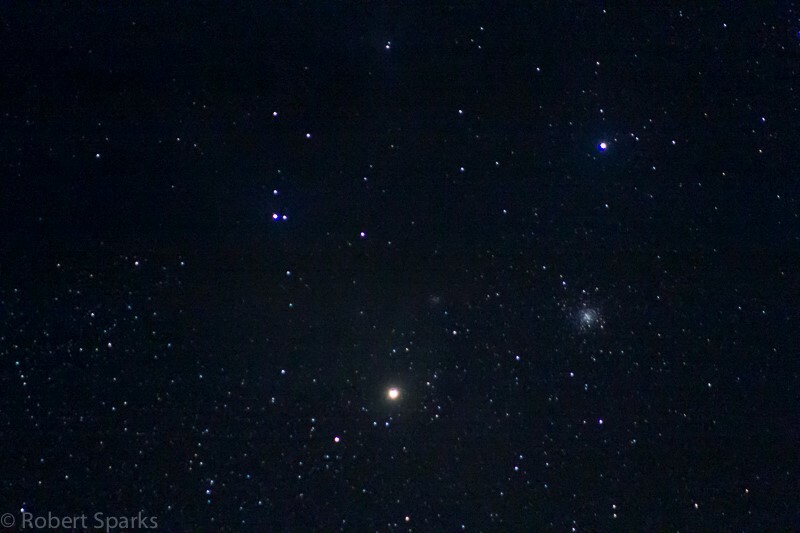 There is a globular cluster (M4) very close to the bright star Antares. A globular cluster is a gravitationally bound collection of 100,000 stars or so. M4 is one of the closer globular clusters at about 7,200 light years away. Globs (as the are affectionately known) consist of very old stars and this cluster is over 12 billion years old. Since it is so closer to Antares and close to Earth, I thought it might make a good target to photograph. Antrares is the bright orange-ish star near the center with the cluster to the upper right of Antares. Not bad for a first try. 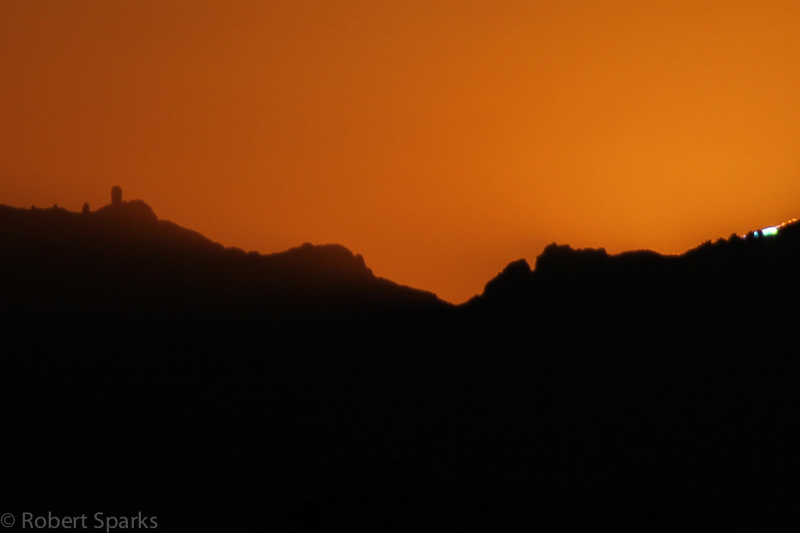 Antrares is one of the brightest stars in the sky and is a red giant, hence the color. You also see a lot of background stars. Antares is in Scorpius, one constellation over from the center of our galaxy in Saggitarius so you get a higher density of background stars the closer you get to the plane of our galaxy. I only have two more nights to get potential photos here before I head up to Alaska for a couple of weeks where it will never get dark! Just a couple of quick pics. 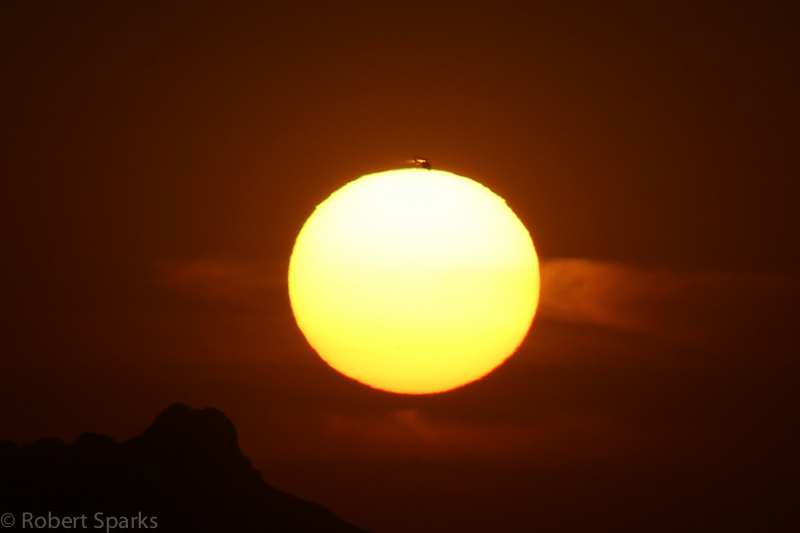 Tonight at sunset, a helicopter flew near the top limb of the Sun. A little luck and a little alertness allowed me to snap an interesting photo. 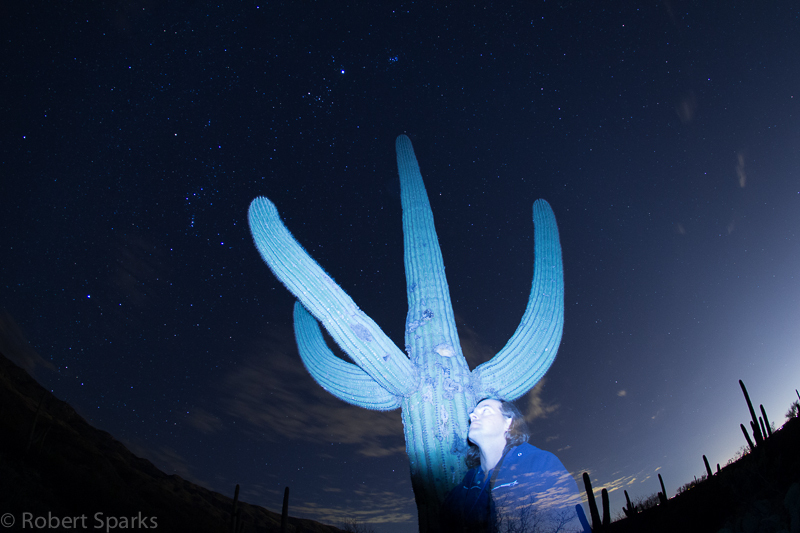 For the planet conjunction, I decided to find some nice saguaros for the foreground tonight. Mercury is noticeably higher. 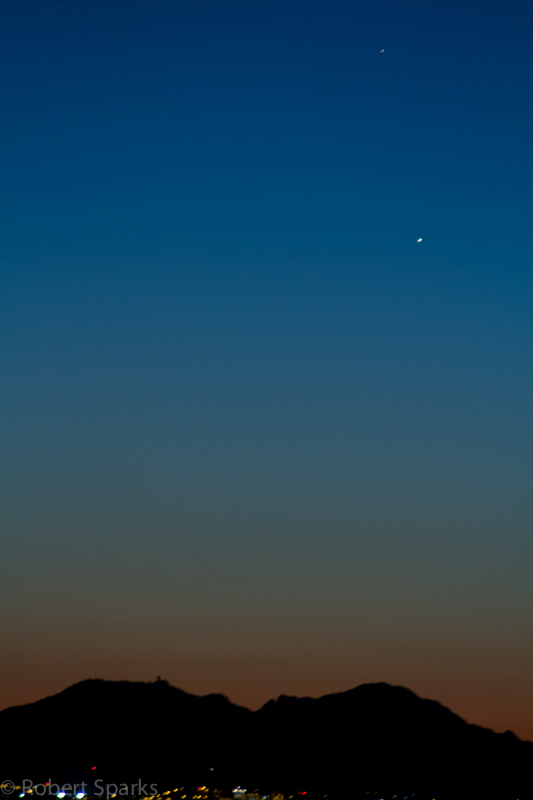 Tonight will be the closest approach between Jupiter and Venus. Jupiter will get lower each night as Venus continues to slowly rise each night. Fun to watch the constantly changing positions. I have been posting some pics on facebook, twitter and google+ the last week of the current triple planet conjunction in the evening sky. 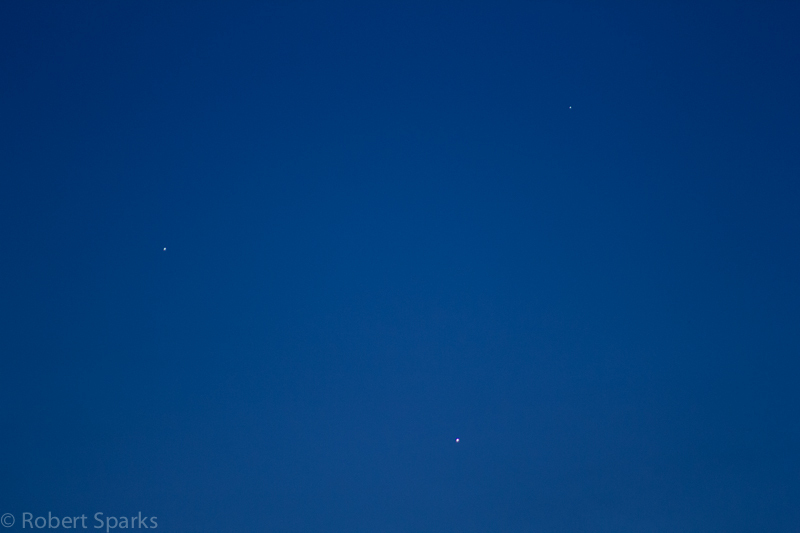 Last night the three planets made their closes approach to each other. 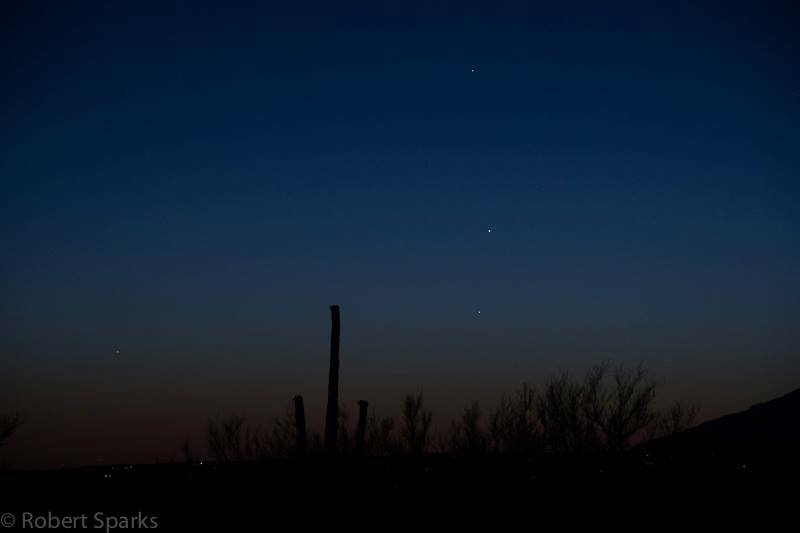 Mercury, Venus and Jupiter were all easily visible to the naked eye and this is a great time to be watching them. You can clearly see the movement from night to night as their relative positions change. Here are some pics from Tucson last night. First a close up of the trio. Next some wide shots of the three. 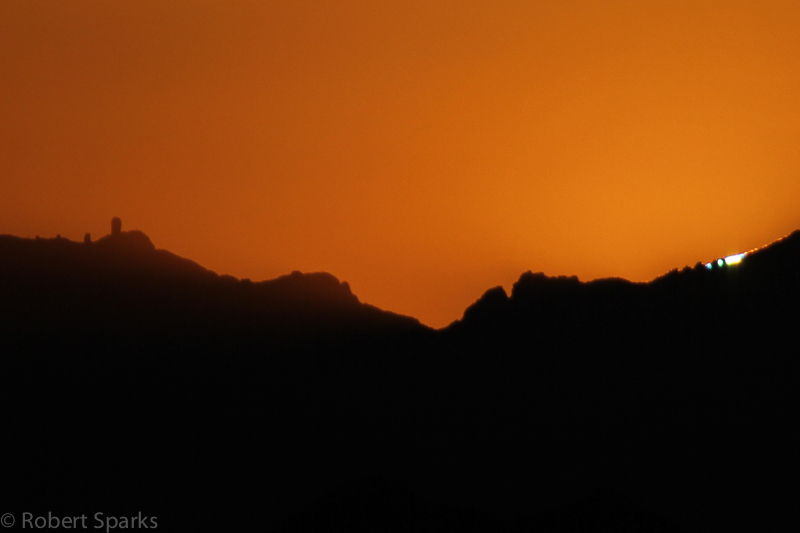 There were low clouds on the western horizon so I got to watch the three play hide and seek amongst the clouds. Although the night of closest approach is past, they will still be visible together after sunset and worth looking at for several more days as they continue to move away from each other. Jupiter will be lower each night while Mercury speeds higher and above Venus each night. Eventually Mercury will turn around and pass Venus as Mercury dives back toward the Sun and Venus continues to get higher in the sky (by this time, Jupiter will probably be too low to see easily). 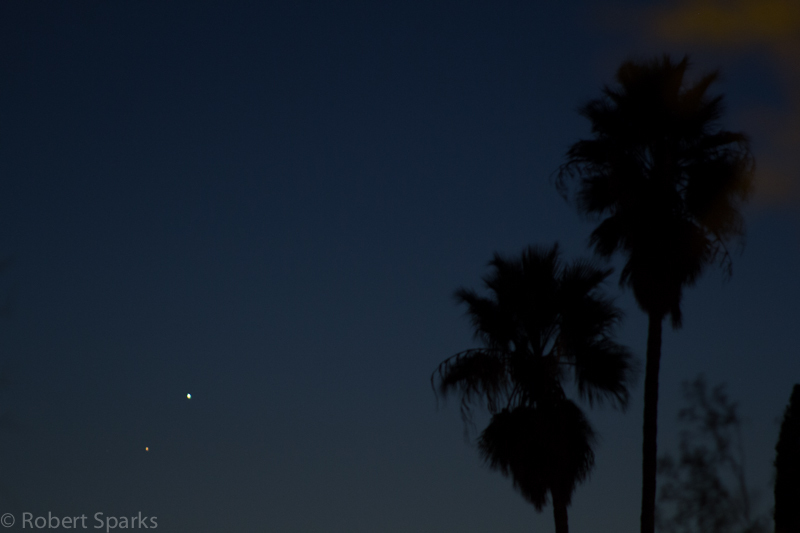 Enjoy this one…we only get these triple conjunctions every few years. Tonight was the Mercury-Mars conjunction when they passed within about 0.25 degrees of each other. Well, closest approach was at 17:00UT (about 10am Tucson time) so these pics were about 8.5 hours after closest approach. That may not seem like much, but tonight Mercury is above Mars, the reverse of last night, so these guys were moving fast. Here are a few pics. 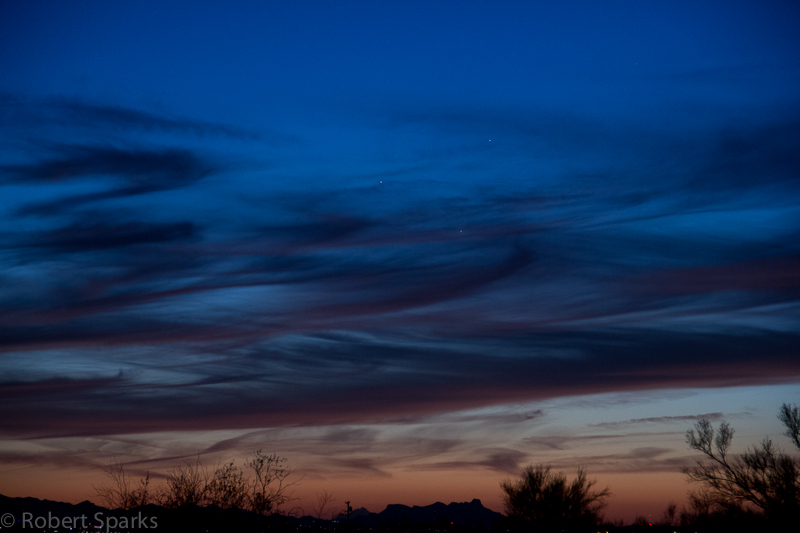 I got out tonight to photograph Mercury and Mars. 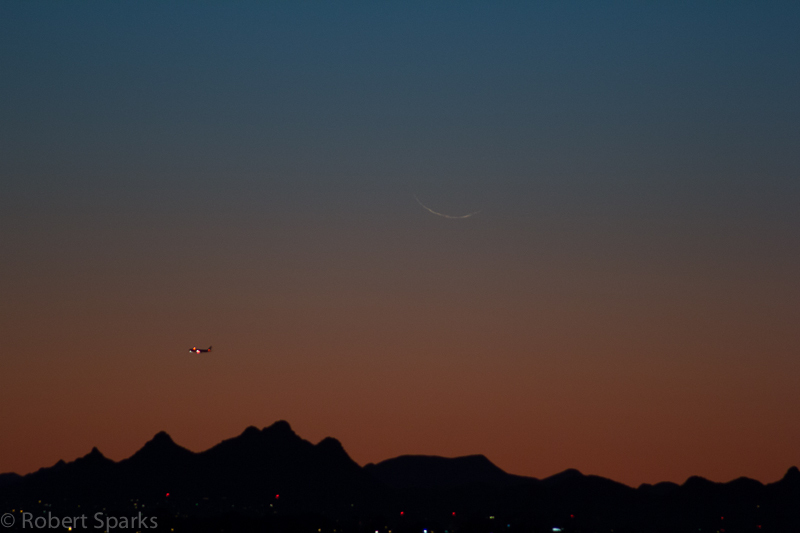 They are rapidly converging for a very close encounter on Friday evening when they will be separated by about half the diameter of the full Moon (forecast is for cloudy in Tucson Friday so I figured I better get them when I can). 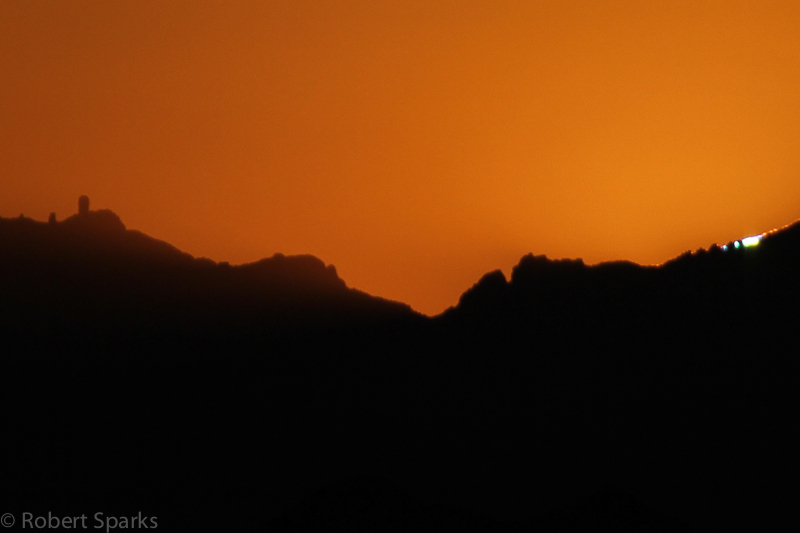 I was lucky enough to get them just above Kitt Peak as they set. 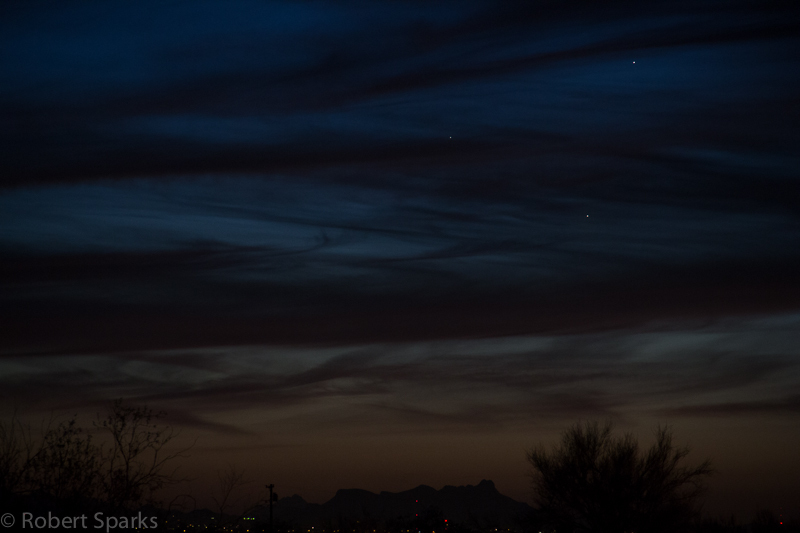 Mercury is the bright one on the bottom and Mars is fainter and higher in the sky. I snapped a series of pics of the ISS pass. This pass was near maximum brightness. Click through the gallery for all the shots. Enjoying the new camera. 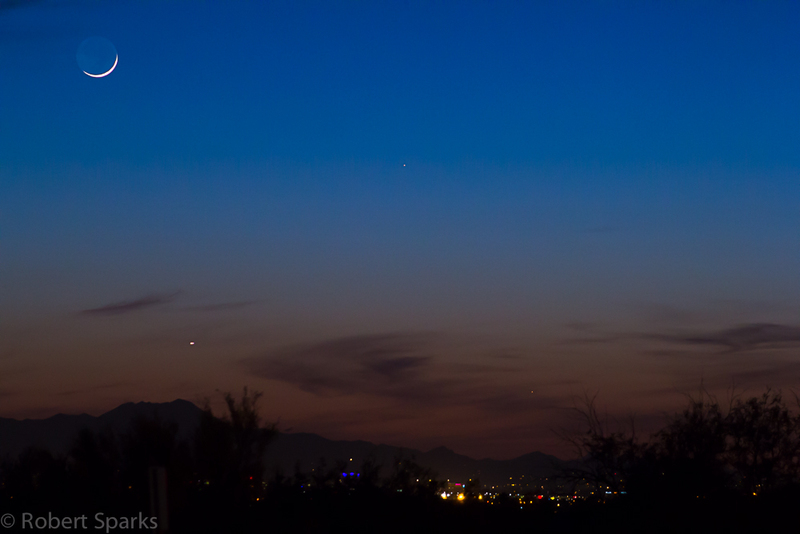 Hoping for clear skies for the next couple of nights for more Mercury/Mars pics! The last three mornings the Moon has been passing through a nice gathering of planets. 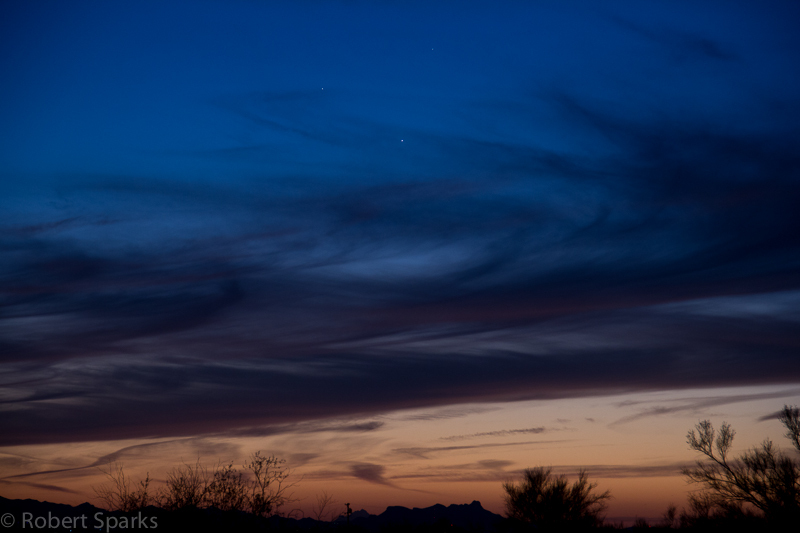 Saturn is the highes in the sky, bright Venus beneath it and Mercury hugging the horizon. 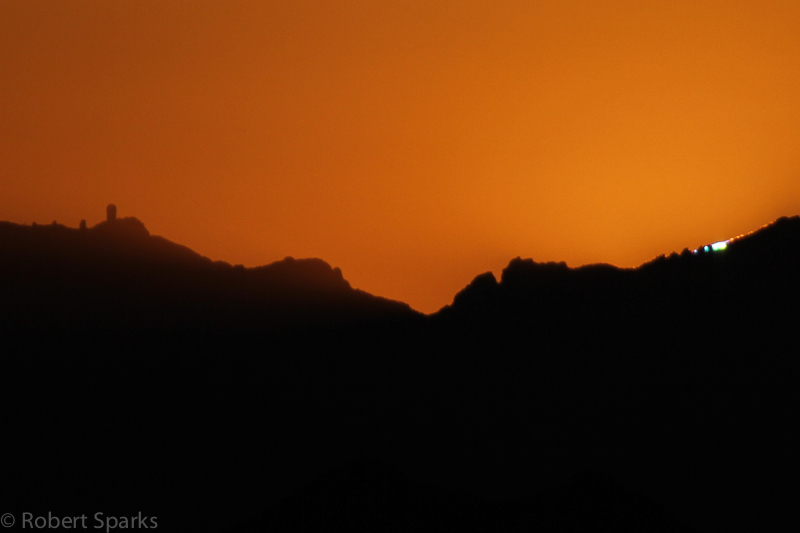 I have gotten up early each morning to snap a few shots and then crawl back into bed. Here is a gallery of the last three days. You can watch the Moon get lower in the sky each day. Mercury is dropping rapidly (when I got out there this morning, it hadn’t quite cleared the mountain even though it was the same time as yesterday). Venus will get a little lower each day and Saturn a little higher each day so they are moving apart from each other.